Do you ever look at your child and fill up with an overwhelming sense of pride? Of course there are moments when you feel that Pol Pot would beat you in a compassion competition but for the most part you take pride in being a good parent. You love your child and you would don a wing suit and dive headlong off the Eiger for them if you had to. Occasionally, the rewards for your countless acts of compromise sneak up on you and quite literally give you a rush greater than accelerating at 9.8 ms² towards that alpine meadow in Grindelwald. Memorial weekend had me feeling like the GoPro was set to extreme and capturing all kinds of footage. This write up is intended to give an insight into the achievements of my 11 year old son and to finish with some of the strategies we employ that made it possible. Kimberly was in Alaska with a high school group and Cai & I were home alone for two weeks. It made sense that we had an adventure of our own so we planned for 3 days of backpacking in the Lost Creek Wilderness, 60 miles from our home in Denver, CO. Lost Creek is an incredibly beautiful spot, partially ravaged by the Hayman fire which opened up amazing views and yet the trail is often shaded by trees. The main attraction though is that the snow melts earlier here than the alpine areas we are usually drawn to. It is also unique in that it is filled with granite cliffs and blocks some of which have toppled filling the valleys and hiding the creeks that flow through them. It is a very complex topography and trails through it have an unusual habit of roaming all over the place to find the line of least resistance. Saturday morning we left the house by six in an effort to make sure we would secure a parking spot at Goose Creek trailhead. (Day 1 Map) We were hiking by nine. Our mantra was, “We have open minds and three days to do what we can.” I had potential lofty goals but was not really tied to them. Dropping down to the creek and our first junction, the charred remains from the 15 year old fire allowed for new growth and wild flowers. A trail crew were tidying up after the winter deadfall. We stopped to chat, the leader had been taught to use a cross cut saw by Cai's godfather. I love how intimate the outdoor community can be. We started to climb steadily and by lunchtime we had reached our first (Hankins) pass, four miles and 2000 feet above our starting point. We sat to ponder the next stage of the route, we had a choice, climb another 1200 feet over the Lake Park trail and drop back down 800 feet or head west and lose 1100 feet and climb up to the same spot. Cai elected for the high route. I was happy because I knew the views would be spectacular. I was though curious about the snow. Well, we were proven right on both accounts, the views were amazing and at the highpoint where we looked down the half mile to rejoin the main trail we were stopped dead in our tracks. Or rather we were stopped due to a lack of them. Our way was blocked by snow which in the middle of the afternoon was soft and led to knee to waist deep floundering. No one had been on this part of the trail and there was no compacted snow that might support us. We were faced with choices. Camp where we were, our wood burning stove allowed us to spend all afternoon melting snow for water, and head down early in the morning when the snow had refrozen and might allow us to walk on top. We could go back to Hankins Pass and then descend to the West. Or finally, we could take two days to make our way back to the car the way we had come. Cai elected for the second choice, so we retraced our steps then descended some more. We reached camp at 7.30 having hiked 12 1/2 miles and gained 4000ft and dropped 3000ft. It was a long day and Cai was still in good spirits while he helped to set up camp, filter water and cook dinner. We got to bed around 10 p.m.
Cai blew me away by electing to get up early the following day, (Day 2 Map) he did not want a repeat of the day’s ordeal and was keen to be over the pass at McCurdy Park before the sun had time to soften the snow we were inevitably going to find. (My son is a smart kid and I take pride in this.) We were packed and on the trail by six, opting to have our breakfast and coffee after crossing the pass. To fuel ourselves we filled our pockets with snacks. It was an early morning grind and yet the cool air and different forest ecosystems we passed through maintained our interest. Walking on a plush carpet of duff, the sound of a steep creek and birdsong accompanying our travail was particularly inspiring. There was also a huge satisfaction of walking quietly past closed tents, wondering who the occupants were and when they were going to surface. By the time we reached the junction with the Lake Park trail we had done a detour of seven miles and a lot of uphill. It seemed strange that we were only half a mile from our high point of the day before. Cai was happy with his decision and I was glad I had let him make it. This detour had curtailed our loftiest goal of trying to go over Bison Peak which at 12,431 is the highest point of the wilderness, however I do not think we would have enjoyed the decent to the North so this was just as well. It also meant that the 20 mile loop we had contemplated was now going to be a more sporting 27 miles instead. At McCurdy Park three miles and 2000 ft later we met a party who had pushed through from Lake Park the previous day, it was nine o'clock and they were nursing battered bodies and slowly eating breakfast. Their camp site was like a scene from Apocalypse Now. They said we had made a wise choice. Again Cai was glad. The snow here was easy to cross at this time of day. A trail had been punched through and then frozen. We made light work of it and found somewhere to sit and make coffee and oatmeal having dropped below snow-line. While we slouched in the shade a number of the tent occupants we had passed earlier came hiking through. For the most part we were bemused by the size of their packs and wondered what we might feel like if carrying similar loads. The rest of the day was hot. Being a Bank Holiday we saw lots of people coming in the opposite direction. Our trail lost a lot of height with continuous switchbacks, I doubt measuring the trail on the map will give a true representation of its length. The map said we walked 10 miles that day, it felt longer than the previous day and we rocked into camp around 6.30. Again we walked past a lot of the people who passed us earlier and chose to set up camp mid afternoon. We did not envy those toiling with big packs up the hills we were descending in that heat. the sweat and grimaces did not look like fun. Our last day, (Day 3 Map) was another early start but we had smelled the barn. The final four miles were gentle and completed by 8.00 giving us plenty of time for unpacking and ice-cream. We had walked at least 26 1/2 miles with 6000 feet of ascent and descent. It had been an incredibly beautiful journey, challenging and yet manageable. Neither of us had been sick, had blisters or any other major discomfort. So what can be learned from this trip. 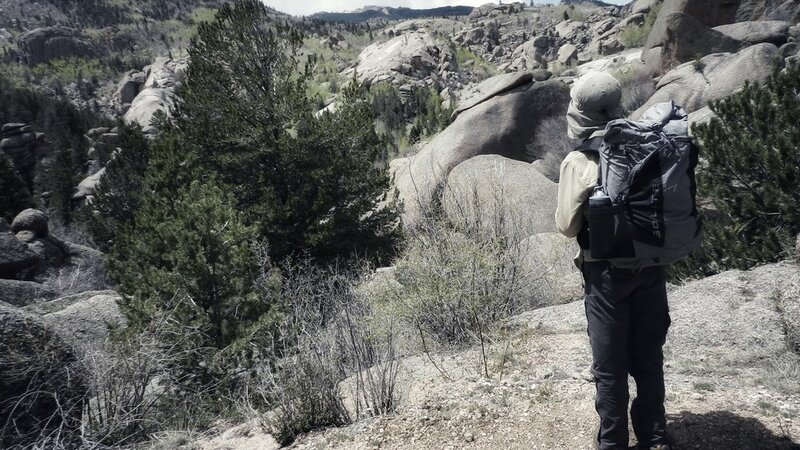 First and foremost we realized that Cai had done his first backpacking trip a decade earlier. This is not his first rodeo. During our time out together we have focused on a philosophy of light is right. I devour ultralight backpacking guides and translate them into kid friendly travel. For a shelter we use the tarp from a mid style tent. We do not bring luxury items except for a fishing pole. When choosing a pack for him, rather than a child’s backpacking pack which all appeared heavy, we opted for a small lightweight backpacker’s pack. We carry only a set of thermal underwear and a pair of socks as spare clothes. 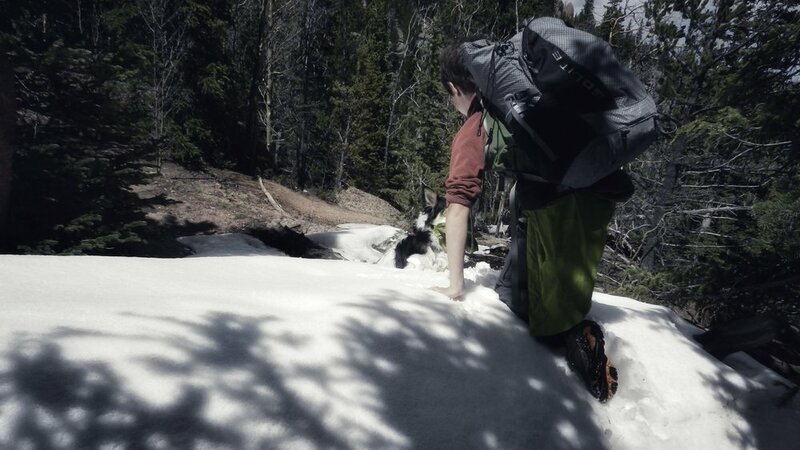 A light summer weight sleeping bag and down jacket are more versatile than a warmer bag. Our meals are simple and usually only require us to boil water. We use a small wood burning (or alcohol) stove for heating the water. Having gone through the filter, chemical, UV treatment debates we have settled on a small squeeze filter. The water tastes great. Basically, our bags are small and light making travel far more efficient and easy. Due to our light bags we wear lightweight trail running shoes. I have taught Cai to read a map since he was very small. We focus on the 3 D’s. Distance, direction and details. He always has a map and small compass in his pocket. This gives him autonomy and the confidence to make choices. I encourage him to make the choices. I carry bribes in the form of candy (usually chewy sours of some description). I don’t have to use them anymore. Ultimately, it has to be fun. Dad is more easy going and more jokey outside. We talk about things he wants to talk about and we also observe what is around us and discuss that. We highlight the metaphors and analogies for life from our adventures. Most of all I do not push him. I ask him, I encourage him, I lay out the choices and he usually rises to the occasion. Waking up and seeing the angelic face of your child in the light cast by golden morning hues and tent fabric is one of the more beautiful sights I have witnessed. Listening to the “sleep breathing” earned by hard work the previous day helps etch this vision indelibly in my mind. There are very few things as good as sharing this nature time with a child. If there is anything I can do to help you experience this same pride in your child, please let me know.